M 51 or NGC 5194/5 is a beautiful galaxy in costellation Canes Venatici (CVn). This galaxy consists of 200 billion suns. She is situated 30 million light-years away from our home galaxy (Milky way). The atmospheric condition here in Germany prevented me in the past from visually recognizing any structure looking through my old 8” SC telescope. It was one of my most delighting experiences to see this galaxy appearing on my computer screen - so to speak “out of nothing”. 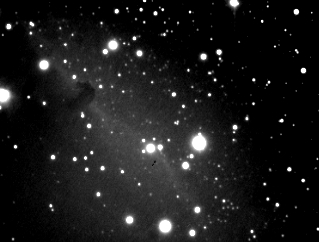 The Horsehead is a dark nebula (Barnard 33) seen in silhouette against IC434, which is much larger and very bright. This object is hard to catch even with large optics and CCD cameras. 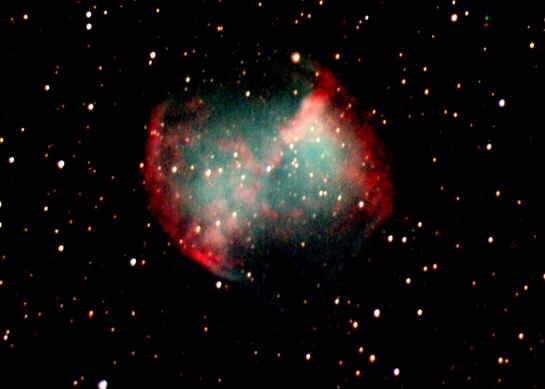 This exploded star in constellation Lyra (Lyr) is called M 57 (NGC 6720). M57 is 1500 ly away from us. In other terms: 1500 x 9,000,000,000,000 km. Today the ring has a diameter of 450,000,000,000 km. M57 appears ring like because we are looking down a barrel of gas cast off by a dying star 20,000 years ago. Since 1500 years these very photons (see image) were on their way traveling at 300,000 km/second, before they hit my CCD matrix in my observatory. The remnant star has a surface temperature of 100,000 °C and therefore is approx. 4000 times more luminous than our sun. 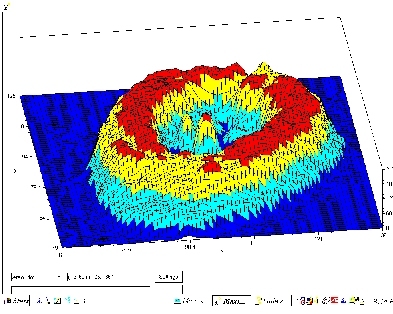 The spectral analysis indicates Oxygen, Hydrogen, Helium and Neon as ingredients of the exploding ring structure. If this star had planets in the past they would have been melted, boiled and then evaporated 20,000 years ago. Long time observation shows an expansion velocity of 918 times the speed of sound. This seems to be the exact fate of our own solar system and the total destruction of the planet earth is unavoidable. But, there’s still some time...10 billion years we hope! 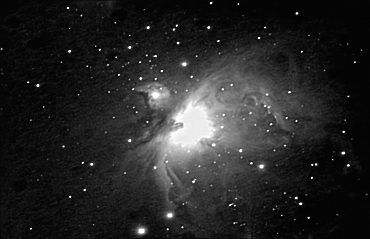 The great Orion Nebula M 42 (NCG 1976) is a cloud of gas and dust glowing from the light of hot young stars embedded in it. It is situated within our own galaxy. You may spot this object even with naked eyes easily. This object is 1400 light-years away from our solar system and has a size of 25’x30’. 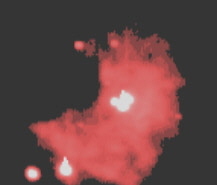 M42 is - in contrast to M45 - an emitting nebula which one could tell from its redish color which indicates the glow of the prominent H-Alpha transition (Hydrogen Balmer-Series). Unfortunately I do not have color images of this object yet. Within the very center of the most luminous part you see (small image) the Trapez star system which actually is a 6-fold star but you may discriminate only 4 close stars on my enlarged CCD image on the right side. 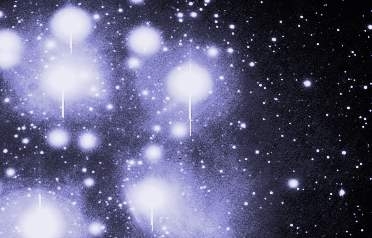 This open cluster is called M45 or Pleiades or even “Seven Sisters”. It is delightful in any instrument, from the naked eye to the largest telescope, although I find large binoculars give the most impressive view. Constellation: Taurus (TAU). On my CCD-image you see the associated blue nebulosity which indicates a reflecting hydrogen nebula. 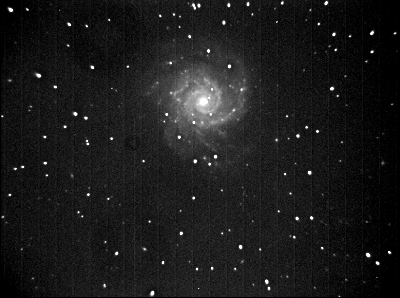 M 74 (Pisces) is one of the most perfect examples of a face-on spiral galaxy 30 ly away. Hard to find - needs image processing (MaximDL-CCD) to compress the dynamic range of core and arms. 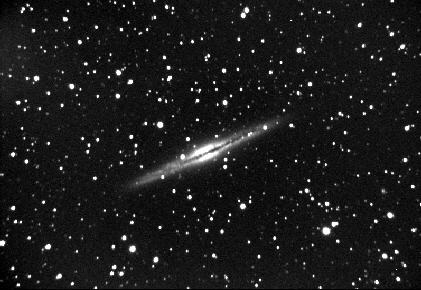 This is a prime example of an edge-on spiral galaxy in Andromeda. In our own “Milky Way” similar clouds of dust and dark nebulosity are responsible for the irregularities and dark lanes in the Milky Way which you may observe with naked eyes in a starry night. The big difference here is: You see it from outside a galaxy and from the edge. Distance from us is 43 million ly. Picture was taken with F/3 and 300 sec.